Today, democracy is the world’s only broadly accepted political system, and yet it has become synonymous with disappointment and crisis. How did it come to this? In Can Democracy Work? James Miller, the author of the classic history of 1960s protest Democracy Is in the Streets, offers a lively, surprising, and urgent history of the democratic idea from its first stirrings to the present. As he shows, democracy has always been rife with inner tensions. The ancient Greeks preferred to choose leaders by lottery and regarded elections as inherently corrupt and undemocratic. The French revolutionaries sought to incarnate the popular will, but many of them came to see the people as the enemy. And in the United States, the franchise would be extended to some even as it was taken from others. Amid the wars and revolutions of the twentieth century, communists, liberals, and nationalists all sought to claim the ideals of democracy for themselves—even as they manifestly failed to realize them. Ranging from the theaters of Athens to the tents of Occupy Wall Street, Can Democracy Work? is an entertaining and insightful guide to our most cherished—and vexed—ideal. 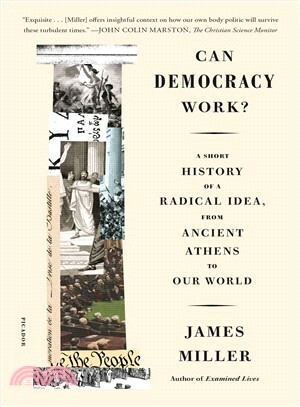 James Miller is a professor of politics and liberal studies at the New School for Social Research. He is the author of the critically acclaimed Examined Lives: From Socrates to Nietzsche; Flowers in the Dustbin: The Rise of Rock and Roll, 1947–1977; and Democracy Is in the Streets: From Port Huron to the Siege of Chicago.